Mid-August means the State Fair is right around the corner, and it is time to decide what to enter this year. I have to get my paperwork in before the end of the month, then get the entries ready. Quilts need hanging sleeves, and everything needs a label too. I got my catalog last month, and you can see all the little post it notes I have sticking out of the top and sides to mark the categories. I know I want to show my Christmas Trip Around the World that I made last December, so it needs a sleeve. With football season just around the corner, this will be my slow stitching for August. I need to decide if it will go in Bed Quilts Pieced, or maybe Wall Quilts. I need to see if it is larger or if one of the others is larger. I have linked the posts on each of the projects here in case you want to see more. After looking at the quilts I made over the past year, there are too many to enter in the categories given. You can only enter one per category and I have made too many bed quilts. I know that Quickstep would get criticized for the cut off points that are unavoidable in the design, so it will not get shown. It is fine for a winter day, and a nice design for a charity quilt, but not for show. 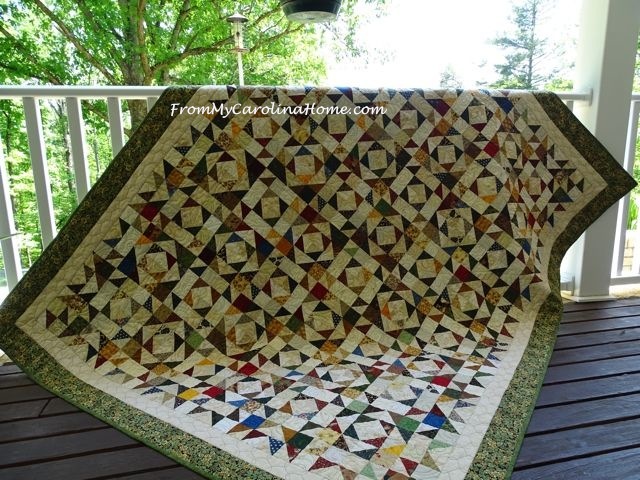 So I think I’ll show Scrap Dance in the Wall Quilts category, now that I fixed the mistake. Tango will go in the Pieced Bed Quilts category. I know that the Fair will have the same quilt judge as last year, and she is tough! Entering in the fair is like entering a big show with this judge. 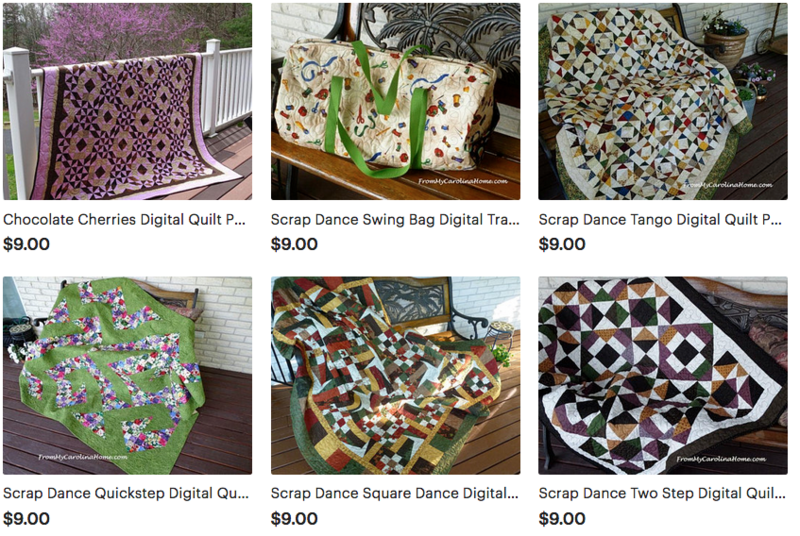 Both the original Scrap Dance, and Scrap Dance Tango patterns are available in my Craftsy store, just click on the link on the sidebar. 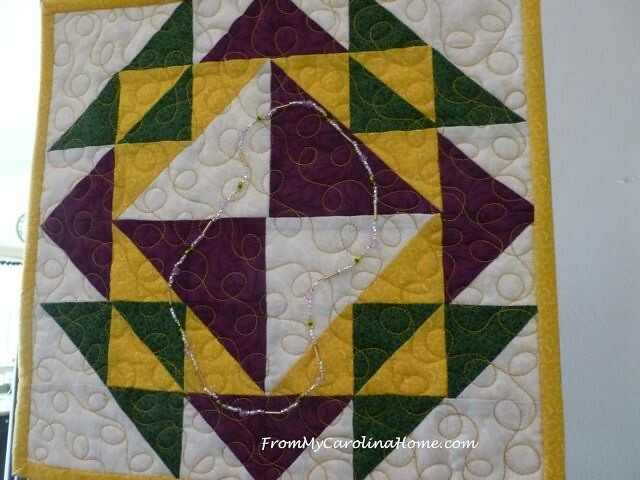 I am going to enter Mardi Gras in Wall Quilts Embellished. I just hope the judge understands the embellishment is a necklace like the beaded ones thrown in the parades. 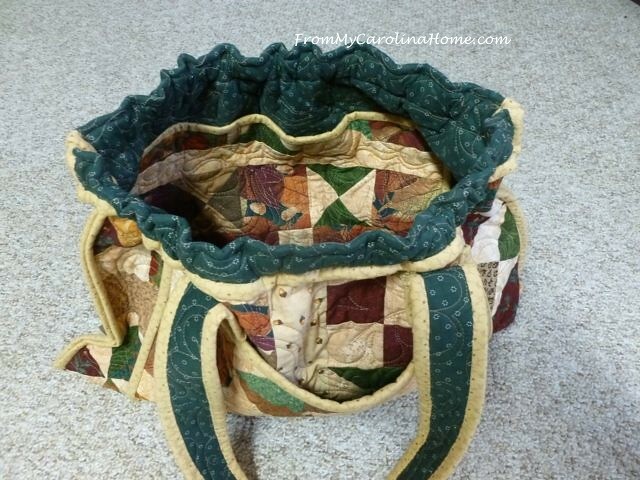 I’ll be entering the Quilted Art Project into the crafts category. 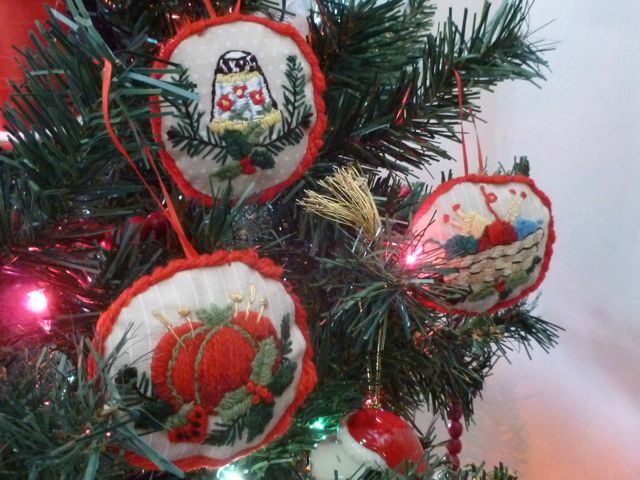 The crewel ornaments from last year will be entered in the crewel handwork category in the crafts section. My original design Christmas Wool Penny Rug will go into the hand applique category. 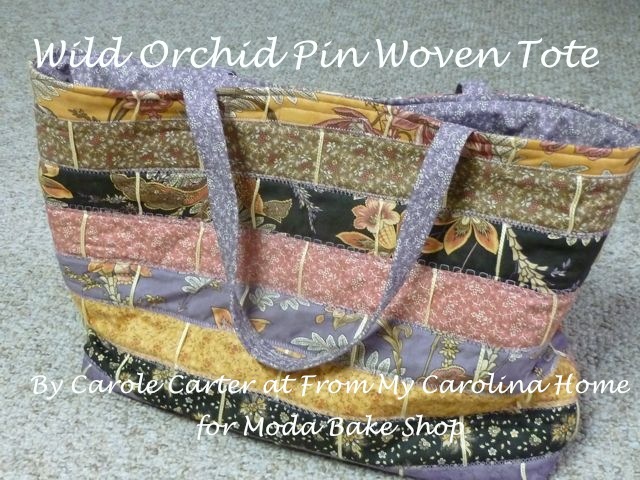 That pattern is available free on the linked page. Don’t forget, for readers of my blog during this event, Primitive Gatherings is offering you a discount on your wool orders right now for a month! 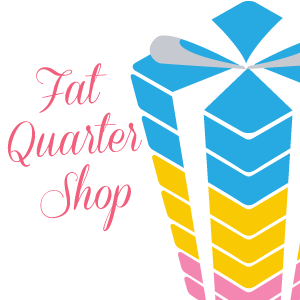 The 20% discount online code is: Carolina This code will be good July 14th thru August 25th and will be good for any wool order excluding the following items: wool bundles, wool charms, specialty dyed wools (meaning customer picks color and texture) unless a full yard is ordered. My order came last week, and I am already planning my next project with it! Click on Wool Order to see what they have. I need to decide on some other categories too, and find recent finishes to enter in the senior citizen categories. I really don’t consider myself a senior, but the category is there for anyone over age 55, so it gives me more chances to enter things. My Scrappy Travel Bag might get in this section. 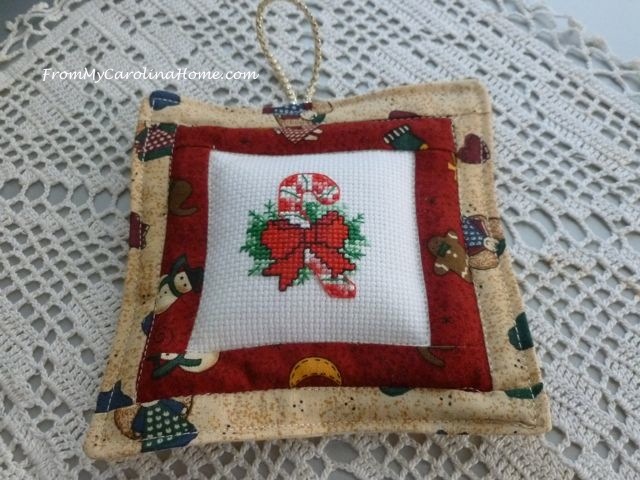 This little ornament will get entered into the cross stitch category. I’ll be entering four photographs this year too. I really like this one of these birds, looks like they are discussing the hot weather. 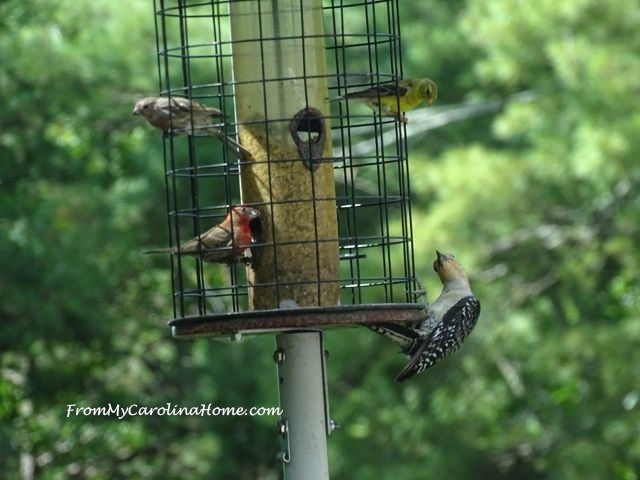 In reality, the goldfinch was trying to decide if he could run the woodpecker off, which he did try to do just a moment later. There isn’t a bird category, so I hope the Animals and Insects category will do. I have a couple of photographs from last year’s fair that I will enter this year. Last year I won a first place ribbon in that category with this photo. 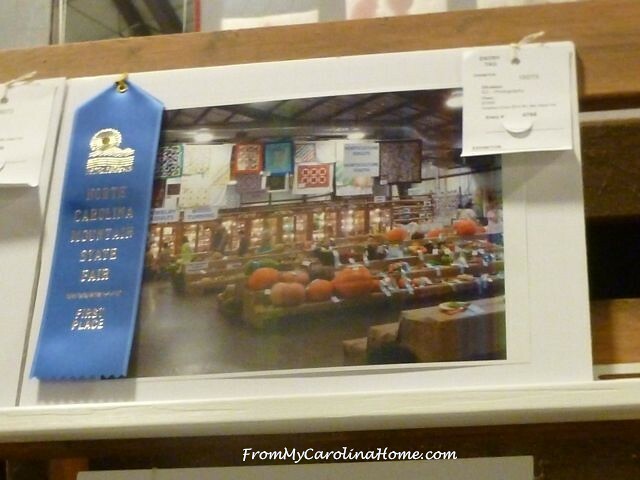 I tried to capture the essence of all the contests, with the veggies in the foreground, the display cases in the back and the quilts overhead. 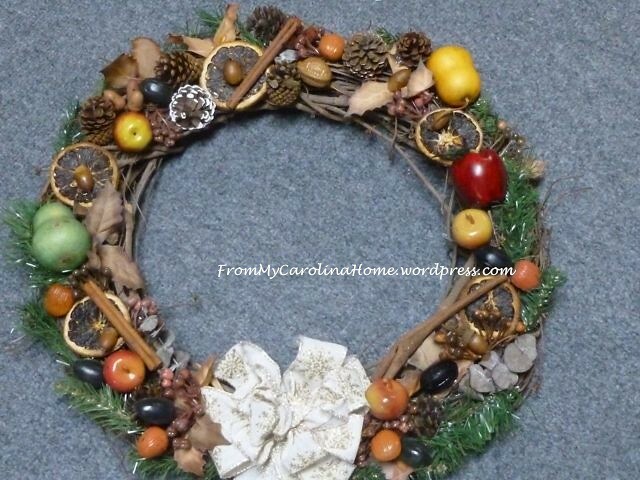 I’m thinking of entering a wreath in the natural materials project category. I have some sweet gum balls and pine cones I can use. I need to redo my fall/winter wreath anyway, so this would be a good time to do that. It hung outside all fall and most of winter last year and needs some care. If I fill in the bare spots and change the bow, it would refresh it nicely for fall this year. Ah, decisions, decisions! What to enter and what not. Being a constantly moving creator of all kinds of crafts, this decision is difficult. But, when the Fair is underway, I’ll bring that to you. I hope there will be a ribbon in my future! Do you go to your state fair? Have you ever entered any contests? 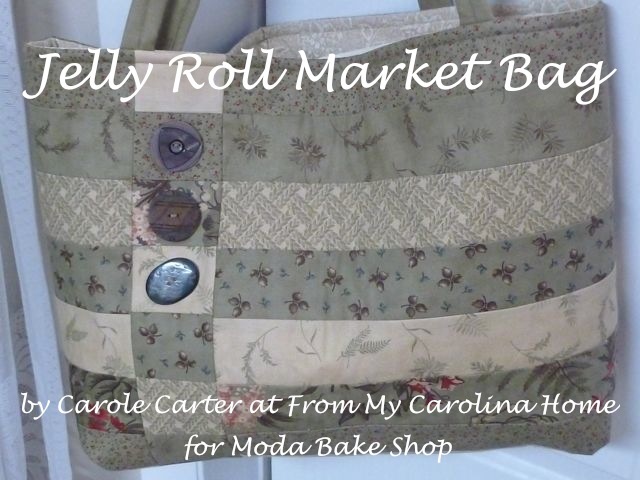 Good luck Carole-your entries are amazing! I will have to check the State fair here, I have been a cuople of times, but that was before I became a quilter-thanks for the heads-up. Wonderful entries! May you come home with many blue ribbons! Not fair related, but I didn’t want to forget to thank you for sending the Country Christmas Quilts book I won in the drawing! The pkg arrived just as we left for the airport, so I had something to look fwd to upon our return from visiting grandchildren for 10 days! Inspiring! Thanks a million! 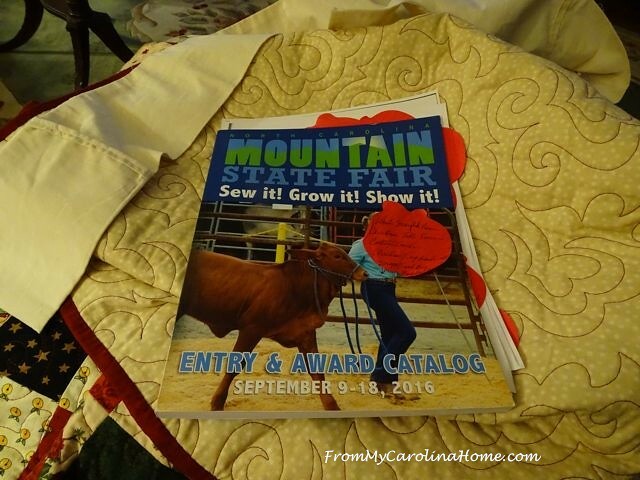 Maybe next year – our fair is over! Have fun with your entries. Whatever you decide will be perfect. Having a tough judge is good, you know you have to work for those ribbons! Looks like lots of ribbon winners there! Best of luck to you! I only entered items in our Fair one time; entered some of my roses in both individual blooms and the bouquet categories and won ribbons, too (though not First Place ones). But, I realized it was WAY too much work for me, a casual gardener. The people winning the Blue Ribbons were way too ‘involved’ in the process, in my opinion — were polishing leaves, using q-tips to get their blooms to open just the right amount, etc. ; I couldn’t believe the staging that went on! While I, the newbie, just schlepped in my prettiest blooms and made a pretty bouquet, etc., ha ha! I’m just not ‘fussy’ enough to want to do that again, so enjoy my roses in my own vases (and to give to others). I have been tempted to enter my purebred Ragdoll kitty in a Cat Show, but am aware of the same amount of fuss involved in showing cats — I’m quite sure my Boppin would be a Blue Ribbon winner, though! 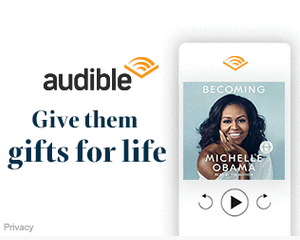 How exciting for you! Once I improve my quilting skills, I might enter in a state fair competition. I used to enter under the painting category but never made it to the judging. All your entries are winners. Good luck..
What beautiful projects, and impressive even more as they are in so many different categories! Sending good wishes! Decisions, decisions. You have a lovely selection of work from which to choose your entries. I hope you do well in the State Fair. My goodness you have quite a lot to enter ~ and all lovely ! Wishing you all the great luck you can get with all the entries you enter in. I remember entering in the Orlando, Fla fair and winning 2 first and I 2nd in a crocheted afghan done in the afghan stitch and then I cross stitched a wedding sampler onto the top for my nieces wedding as her gift from my husband and me when they got married, I made quilled bells in shades of lavender with purple ribbon and they were So thrilled. The second 1st prize was my entry of a quilled eagle done in depth with a red and white stripe background which seem to take forever to do, the second was a sunbonnet sue and friend I quilled and added lace around her apron and she was holding dried flowers her bough had brought her. The next year I entered the quilling section again with a white dimentional owl which took first place and the brown owl took 2nd. We moved here to Fayetteville and I just haven’t entered any fairs since, just enjoy going to them and getting some inspirations to do things for my home now. 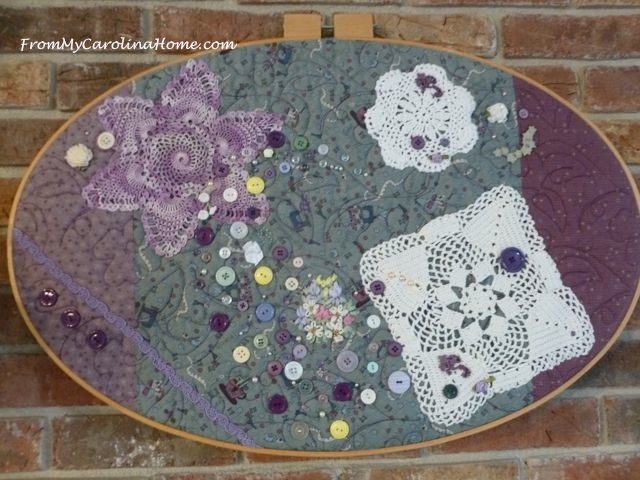 You have given me an idea to use my large hoop and use some of my mother’s crocheted pieces and my many buttons and other items and make a wall decoration for my crafting room, thanks for that inspiration. Again best wishes for lots of ribbons which I’m sure you will receive cause you have some beautiful entries. Thanks for showing us your entries! You’ve been busy. 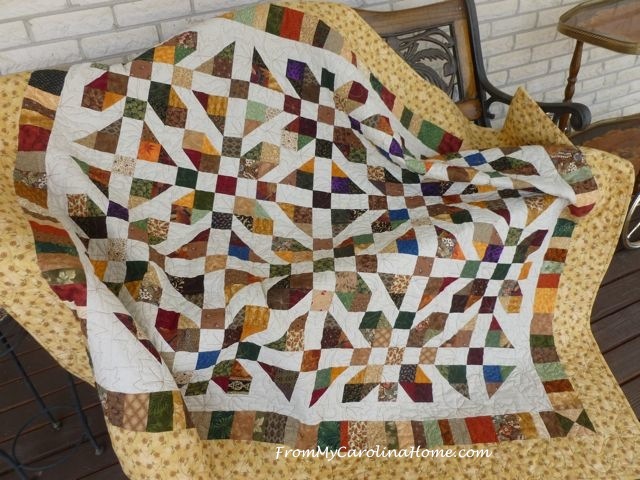 I really like the Scrap Dance quilt! You have chosen wisely. You will knock-um dead. Have a wonderful time at the fair! Wow, you’ve got a lot of beautiful things to enter in the fair! Unfortunately, most of my creations don’t stay at my house, so there’s not much left to enter into the fair. But I love to go and look at what everyone else enters! Whoop whoop!! Best of luck at the state fair. You have wonderful things to enter in the fair. 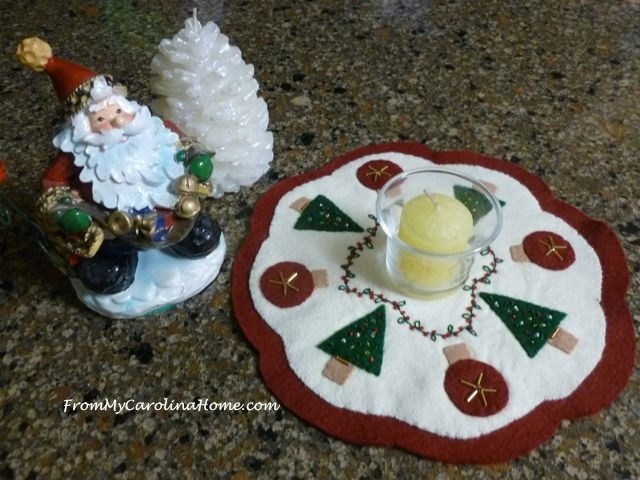 Thank you for sharing your preparations at Snickerdoodle Create, Bake, & Make link party.